rides by a Florida air balloon flight rides company. We at A Hot Air Balloon Ride in St. Augustine/Orlando, Florida ask - have you ever fallen asleep at night and felt the sensation of flying, floating freely above the earth viewing all of creation, only to be awakened to find out it was a dream? Well, dream no more! 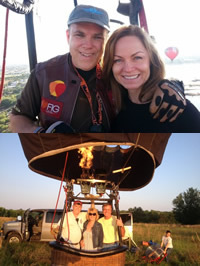 Hot air balloon rides are one of the most unique and exhilarating experiences you will ever have. 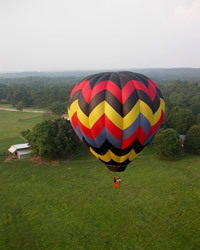 You will never forget your first balloon flight; it is truly an experience that cannot compare to anything else. Now you can experience the sensation of floating above Mother Earth with a breathtaking view of the world below. Just imagine the roar of the burners as you rise into the sky, the silence of floating, drifting with the winds. The sensation of flying over trees, lakes and streams is a unique, inspiring, and "uplifting" experience. This sensation of flight creates a still calmness to the soul with no comparison. 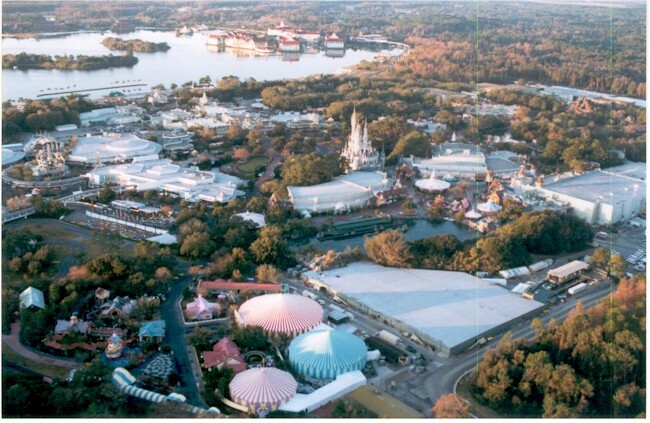 Whether flying just above the orange groves and treetops or high into the heavens, the view of Disney World in Orlando or the Atlantic Ocean in St. Augustine is unmatched by any other experience you may have ever known. 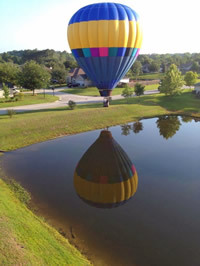 Let A Hot Air Balloon Ride in St. Augustine/Orlando, Florida provide a new and exciting experience in your life as you view Mother Nature’s beauty as seen from above. 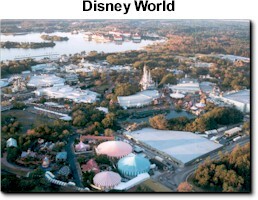 See Disney World from a vantage point that few get too experience. Can you just hear, in the soft silence, the deer and other wildlife frolicking below? The cows mooing, and the voices of those who are grounded below looking up in amazement, seeing the unbelievable beauty of the balloon drifting above with its excited passengers exclaiming their joy of this wonderful event are all just a few of the joys experienced from one of our Hot Air Balloons in the St. Augustine/Orlando, Florida area. If you are lucky you may catch a glimpse of an alligator as they float below. Or you may see deer, wild boars or a majestic bald eagle. Can’t you almost just smell the orange blossoms as you float over Florida’s famous, gigantic orange groves? Imagine yourself yelling down a greeting and be amazed how clearly you can be heard and responded to by the well wishers below. 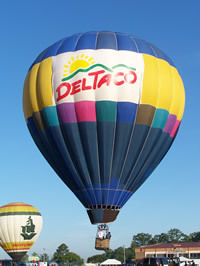 Hot air balloons are a timeless and unique form of flight. You don’t feel the wind, you are a part of it, almost not even realizing you are moving. 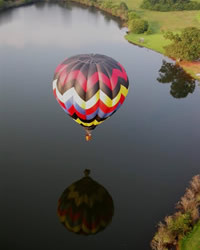 Hot air balloons drift gracefully above the terrain where peace and tranquility reign as you float over the tree tops. The incredible feeling of time suspended as the world drifts quietly below is one you will never forget. Yes, it is truly an amazing and wonderful experience, which can be enjoyed by all. 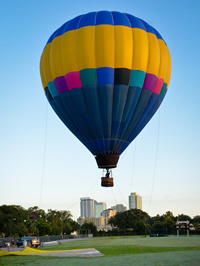 Turn that dream into a reality by seeking the wonderment and grace of A Hot Air Balloon Ride in St. Augustine or Orlando, Florida! For many this is a once in a lifetime opportunity! 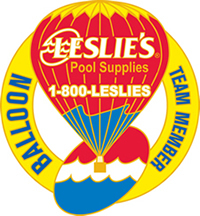 Schedule a balloon flight today! Upon completion of your flight, we will celebrate your adventures aloft with a traditional, sparkling beverage toast where you can reminisce about your journey with your Captain and crew. You will also be blessed with a special balloonists’ prayer to commemorate the flight. 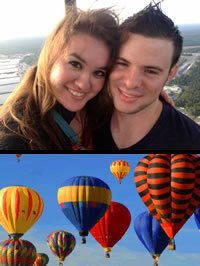 If you really want to make a lasting impression, a hot air balloon ride is the ultimate "unforgettable" gift. Gift Boarding Passes are available. The safest and most beautiful flying hours are just after sunrise when the winds are at their lightest. In Orlando we can pick you up at your hotel approximately one hour before sunrise. In St Augustine we will determine a mutually convenient meeting spot. At that time you will receive a special briefing by your Pilot-In-Command. After your briefing, we will choose a launch area, which varies depending on wind and weather conditions. 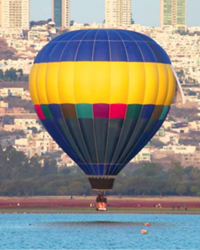 The flight will last approximately one hour, but you will need to allow at least 3-4 hours for the whole experience.. After the passenger safety briefings are completed the hot air balloon will be prepared. As part of the experience you are always invited to help the crew if you would like. When all of the final safety checks are complete the adventure begins. Ballooning is very weather dependent. We always obtain the latest weather forecasts before making a decision to fly. Passenger safety is our prime consideration - so if conditions do force a cancellation we will rearrange your trip for the next mutually convenient date. We are looking for winds that are 8 mph or less on the surface and less than 20 mph aloft (generally above 100 ft), clear visibility and a good wind direction are vital to a safe flight. Generally we will not fly if there is thunderstorm activity within 100 miles of our flight area. If we have to cancel due to wind and/or weather or other circumstances beyond our control we will reschedule your flight for the next mutually convenient date. Sometimes it can take several attempts to get a safe, successful flight off. We ask for your understanding, we want to fly just as much as you do but we want to do it safely. We recommend you wear casual clothing suitable for a country walk, including long trousers and flat shoes or walking boots. Dress comfortably, and preferably in layers, the early a.m. temperatures range from the 70’s and up in the summer. Dress for the weather on the ground in the winter months. It is usually warmer in the balloon due to the burners. Please bear in mind that fields may be wet or muddy. A hat may be needed for those who are a little thin on top as the burner gives out radiant heat. Don't forget to bring your camera and plenty of film. Are There Any Restrictions On Who Can Fly? There are no restrictions but you must be agile enough to climb in and out of the basket and stand for the duration of the flight. If you are in any doubt you should consult your family doctor. You should advise us of any medical condition. Children should be tall enough to see over the edge of the basket (4') and must be accompanied by an adult. Others in your group who wish not to fly may participate by riding in our chase vehicle for a nominal fee. 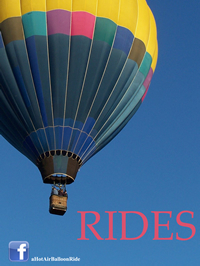 What Does a Hot Air Balloon Ride Cost? 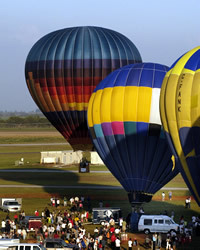 All flights are two to three hour adventures ending with a special balloonists’ prayer, toasting the occasion with champagne mimosas or other special drink. A limited number of passengers will share the flight with you. Private flights for those most special of occasions such as proposals, anniversary and bucket list flights are also available. 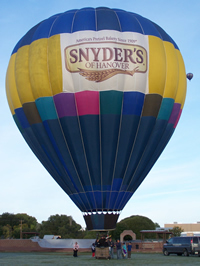 Please see our menu on the "Order Your Hot Air Balloon Ride" page with the link above. Reservations are quick and easy and can be made over the phone with your name, credit card and a few other pieces of information that we will need to gather. After you have completed your reservations with us you will receive further information via text or email detailing our launch site and meet times. 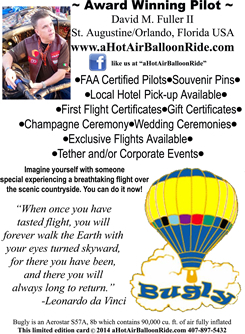 If you wish to give a flight as a gift we can personalize boarding passes with your special message and send them out to you via email with full details of how to book the balloon flight. We do not offer refunds. All flights are wind and weather permitting/subject to availability and 48-hour advance reservations are suggested. We want to honor your requests as soon as possible, we love to fly! So we try to limit blackout dates, but due to our schedule of out of town events we do have several throughout the year. Most of our black out dates are in the last weekend of October through the 3rd week of November. If you wish to fly during those periods we suggest you call us first to verify our schedule as it does change frequently. If Pilot has to cancel due to wind, weather or other circumstances beyond our control, your flight will be rescheduled to the next mutually convenient day. Or we may in our discretion issue you a boarding pass for flying at a later date. Please understand that a lot of work and planning is required to organize your adventure so If you must cancel within 24 hours of flight time, a fee, which will total half of your original cost, will be non-refundable. For safety reasons we must fly as close to sunrise as possible - you must be prompt in meeting us. Therefore, if at your scheduled time to fly you are no-call, no-show, or if you are too late (in the Pilot's discretion) to fly safely - any refund is voided. Safety is our number one priority. We have gone to great lengths to provide the safest equipment possible. The pilot will brief the passengers on their safety and procedures. 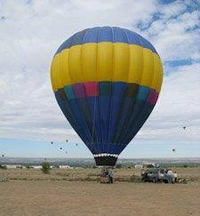 During the flight passengers are always encouraged to let the pilot know of other balloons, or obstructions such as power lines, fences, ditches, etc., that he may not be aware of. If you have questions, PLEASE ASK. There is no such thing as a "stupid question." Hot Air Balloons are aircraft, and as with all forms of flight, there are possible risks. It is important that all passengers understand and realize these risks of personal injury, or loss of life, or damage or loss of property. The landings are most critical and when higher winds exist, the balloon may tip and drag, bounce along, etc. While this is not the typical "stand up" landing, it may happen. All passengers and crew members will be required to sign an "Acknowledgement and Release" form prior to flight. 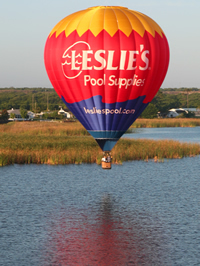 Our pilots have combined experience in ballooning of over 40 years and safety is our top priority. We fly seven days a week, as wind and weather permits. Many organizations have recognized the value of aerial advertising. 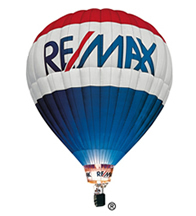 A hot air balloon serves as a floating billboard to display your logo and is excellent for building brand or product awareness. As well as advertising they can be used for corporate entertaining. Taking your clients, competition prize winners, and staff into the air. 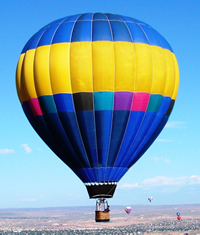 We can offer you a complete package from the specification of equipment to the detailed operation of the balloon. If you would like further information on sponsorship opportunities please contact us. Phone: (407) 897-5432 ~ to send us an email. Copyright © 2004-2013 ahotairballoonride.com. All rights reserved. 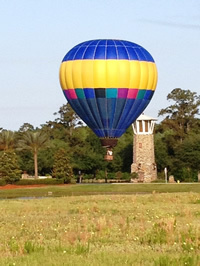 Florida hot air balloon rides in Jacksonville, St. Augustine & Orlando, Florida. 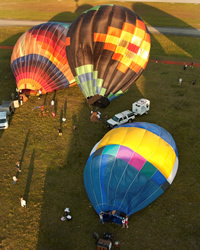 Flight rides from a Florida hot air balloons company based in Orlando.